Ghost Encounters Paranormal Society: The Stork Inn, Billinge. A building was erected on this site in 1640; during the Civil War its crypt was used to incarcerate Royalist prisoners. The crypt survived the rebuild in 1717 and is now the cellars of the modern Stork Inn or Hotel. In 1752 The Stork had a bowling green. Susannah Howard is listed as being a landlady of the Stork Inn around 1881. In August of 1890 landlord James George Howard was charged with selling adulterated rum after his wife topped the bottle up with water in the presence of a plain clothes police-constable. Howard‘s defence was that she was not accustomed to mixing spirits and did not think she was doing wrong. The Bench dismissed the case, warning him to be more particular in future. Born to Richard and Ellen on 26/1/1844, Huge Mather married Elizabeth Peet (born 1845 at Atherton House farm, Winstanley Road), on 29/10/1866. Sometime after 1891 they took over the running of The Stork and its attached farm which they rented from the Bankes estate. Their four daughters, Sarah Ellen a.k.a Nellie, Mary a.k.a. Polly, Elizabeth ‘Bessie’ and Charlotte or ‘Lottie’, helped run the Inn by working as barmaids. The Stork was a resting place for travellers and parties were held there for merchants, the farm providing the food for the elaborate meals. One visitor was Lord Leverhulme. Huge was an easy-going passive man with a sandy beard, for many years he was a member of Billinge Council and served as a Government Official for over 30years as an assessor of taxes and land valuation officer, he was also a sidesman in Billinge church. Elizabeth was industrious, consequently by 1903 they has saved enough money to purchase the ‘Red Knob Row’ of cottages in Newton Road from number 2 onward. Huge died aged 68 on 13th July 1912 from pneumonia after harvesting hay at The Stork. Their occupancy ended sometime in 1912 after Hugh’s death. In 1929 the landlord was Wilfred Hortherstall. 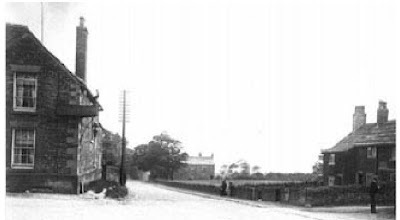 The Stork Hotel; Hugh Mather, 1844 – 1912, and Elizabeth Peet, 1845 – 1933, previously lived in the cottages shown on the right of this picture. There used to be a passageway under the road to the church from the cellar where highway man John Lyon was hanged. I never actually went through that passageway as I was only 9 years old at the time and my father forbade me saying that it was too dangerous. Whilst living in the Stork Inn many Ghostly anomalies occurred. Mostly they were just feelings. However, to go up the stairs, was through a glassed doorway and past the cellar. At one point no one could get up the stairs for an unseen barrier, this phenomenon did not last for long, just enough time to realise that it existed. My Grandmother, who lived with us at the time and occupied the front bedroom at the top of the stairs quoted to the press that she had been pursued round the room by a gentleman wearing a plumed hat and long boots sporting a sword at his side. One night at a party held by my parents for their customers, items like brass chargers etc started to fly off the walls in the public house part of the building. This was witnessed by many people. As for myself when playing up in the big room at the top of the stairs, I always felt like there was someone else there and was scared. All this occurred back in 1966 when my Mother and Father ran the place on behalf of Burtonwood Brewery. My maiden name was Housby.